You can do a lot of website optimization and social media work to get people to pay attention to your nonprofit online, but nothing works quite like your email newsletter. Email is still seen as one of the best methods for converting web traffic into sales—or in your case, donations, new volunteer sign-ups and your cause’s overall awareness. To ensure yours is living up to its potential, follow our nonprofit newsletter tips before your next send. Considering ArcStone’s nonprofit clientele, we know you don’t have a lot of extra time on your hands and getting just one newsletter sent is a big feat. However, if you really want to see engagement, you need a distinct newsletter for at least a couple of your audiences. Start by separating your frequent donors from the rest of the crowd. If you think about it, by creating separate newsletters for each audience, you don’t have to cover as many news updates. You can update donors on the latest report and volunteers on an upcoming event. If you want to save time, you can create a general update/bullet point section with some highlights from all across your nonprofit. Let’s be real. We’re all pretty addicted to high numbers. It’s fun to see your subscription rates grow. Similarly, it’s hard to let any of these numbers go. But you need to! Your email newsletter will only suffer if you’re sending it to the wrong people. Many subscribers sign up on a whim and realize later they don’t actually want your content. This is apparent when you pay attention to the numbers and see inactive subscribers. If you keep sending to these folks, the chances of them flagging your note as spam go up. What’s more, when your data includes them, it fails to help you understand your engaged audience. If you have a marketing automation platform, it’s easy to go through and clear out your inactive subscribers. You can see who has been engaged with your site or content in the last six months. Once you get a handful of the ones who haven’t been, you can reach out and check if they’d like to stay on your list or be removed. Since you so rarely get to speak directly to your audience, it’s tempting to try to communicate a lot to them all at once. The most successful nonprofit emails don’t do that. The sender thinks through what exactly they’d like their reader to get from their email and what they’d like them to do when they’re done reading it. Consider your audience and then find the content that supports what they need to read before taking action. Have just one call to action and make sure not to have too many links throughout. “If you include links to every topic under the sun, readers are likely to get confused or annoyed by your newsletter and unsubscribe.” – Hubspot. Most readers want their inbox to stay clear. They quickly sort through emails judging which ones to delete and which to keep. That’s why your subject line is of the utmost importance. How can you tell if it will stand out? First off, subscribe to other newsletters to see what marketers are trying. You can also a/b test your subject lines to see what works for your specific audience. SumoMe has a great guide to achieving higher open rates. To be honest, we’ve seen a lot of boring emails from nonprofits. They simply want to get their newsletter sent and they don’t do a lot before or after to ensure it’s better than last time. To have an exciting and interesting newsletter, you’ll need to be contributing to your blog throughout the month and keeping an eye on the news from your cause. This will help you have the content to pull from. What’s more, if you pay attention to your analytics, you’ll know what your readers like and you can craft your email around that. Also try including more personal stories, video, news highlights and personality. Seeing as you’re a nonprofit doing great work in the world, every one of your newsletters has the potential to encourage your readers to do something. And at the end of your email, it should be clear that your nonprofit is there to help them take part. 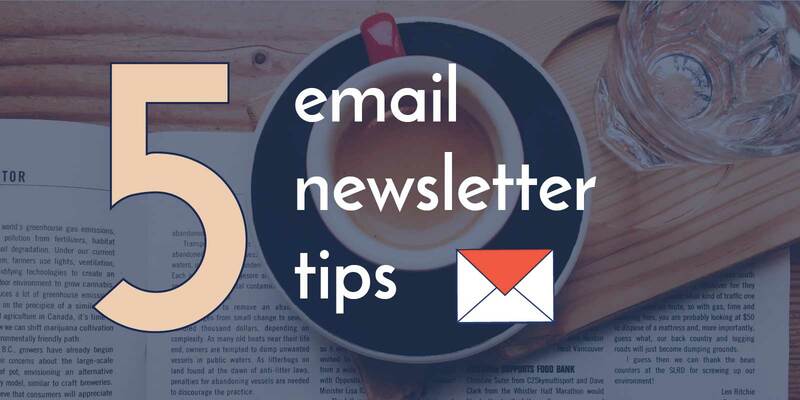 These nonprofit newsletter tips should get you off to a great start, but if you need help executing your emails, reach out to our team. We’d love to help you see higher engagement and more donations as you send out newsletters that speak to your audience.